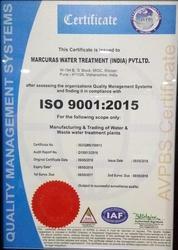 We, Marcuras Water Treatment India Private Limited [Pune], started in the year 2007, are one of the foremost manufacturers of an extensive array of Water Treatment Plant. Our offered range consists of best grade Ion Exchange System, Membrane Separation Plant and Desalination and Zero Liquid Discharge. To manufacturing our offered products in compliance with the set industry standards, our experienced professionals use the modern machines and superior grade production material. Our products are appreciated for their features like easy installation, high quality, application approved designs and longer service life. Also, these offered products are used in various fields like Municipal Corporation, Leather – Tanneries, Tobacco, Cement, Steam Process and Drinking. We have established up to date infrastructural set-up for the production of offered product range. It has various departments like manufacturing, quality control, and warehouse. We have a team of dedicated professionals who have rich knowledge and expertise in manufacturing of these types of products.They monitor all the steps of production to make sure that all the chances of defects and malfunctioning are eliminated effectively. Apart from this, our fair business policies and customization facility and timely delivery have made us highly popular amongour clients. At Marcuras, quality is the focal point of our every activity, work culture, practices and procedures. We strictly adhere to the stringent quality measures in our production facility to match the set international standards for quality. We have employed effective and across the board supervision in each and every aspect of the production process to ensure maximum satisfaction of our valued customers. Adhering to the ethical conducts of the industry, we adopt latest technology and infrastructure to make our products available at very economical prices. Quality is our main forte and we lay strong emphasis on the quality standards of our water treatment plant that enable us to deliver total satisfaction to the customers. Owing to our high-quality products, we have gained a top position in this domain. In addition to this, we are also customizing this range of product as per the specifications detailed by the clients. We take pride in our long list of satisfied customers, who always look up-to us for their various requirements. Through our excellent customer, we have garnered the support of some of the leading industrial units, which reflect our continual quality focus and our inclination towards advanced technologies. At present, major share of our revenues come from our overseas exports to African countries. We are a well-recognized name across the globe for our ability to supply our products to major OEM's. Being a customer focused company, we provide across the board after sale and installation services for our gamut of plants & equipment to ensure maximum satisfaction of our clients. We design our products and services keeping the special and unique requirements of our clients in mind. We, at Marcuras, undertake complete designing and 3D modeling of our range of equipment and plants in our unit with the assistance of our qualified technicians. We provide all the designs and 3D models of all our plant and equipment to our clients for approval before the final fabrication and assembling. Apart from the standardized water purification equipment and plants, designed and fabricated in our unit, we also undertake customization in compliance with the client's specifications. 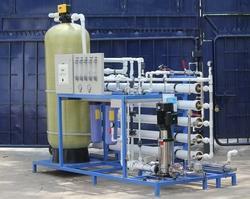 We understand the fact that the type of water purification system you need depends on the water you consume. Hence we can efficiently engineer particular water purification for your special needs. At Marcuras, we have to our credit, execution of several successful projects industrial water treatment plants and solutions. We enjoy strong relationships with our clients, who come from different sectors. We have an excellent record of executing all these projects in stipulated time, which is itself a proof of our sound abilities.